A tool shed, circa late 1800s, found at the edge of the woods and a patch of overgrowth. Located on the grounds at Batsto Historic Village in Hammonton, New Jersey. Unbranded diffusion filter on lens to soften the highlights. Sepia toned in post processing. The town's store, located on the grounds at Batsto Historic Village in Hammonton, New Jersey. A wooden worker's dwelling, circa late 1800s, located on the grounds at Batsto Historic Village in Hammonton, New Jersey. Workers in the village would sometimes live in one of the several identical swellings that lined the road on the west side of the village. 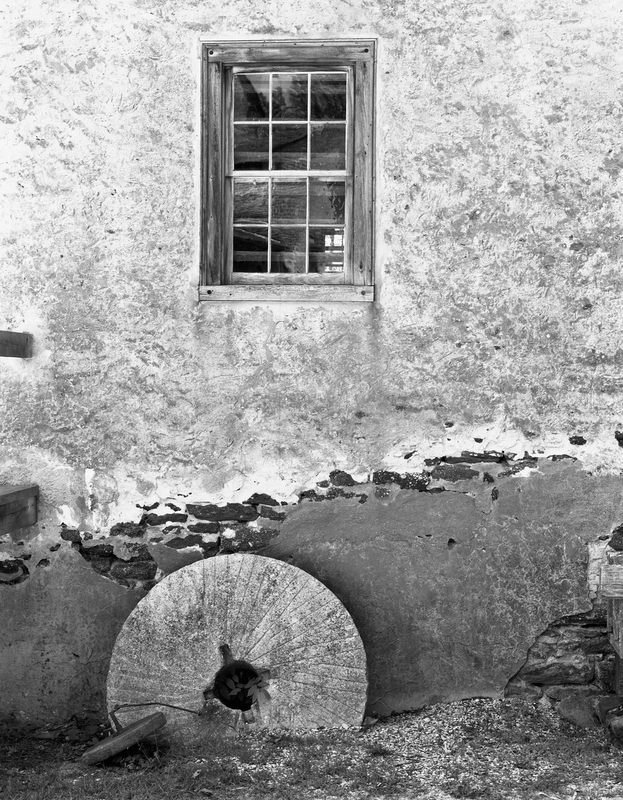 An old mill stone, once used to grid corn and wheat into cornmeal and flour for bread, sits in front of the grist mill at Batsto Historic Village in Hammonton, New Jersey. The south side of the mansion house at Batsto Historic Village in Hammonton, New Jersey. The thirty two room mansion house is the center of Batsto Village and served as the home of the ironmasters who ran the village in the 1800s. In the late 1800s the mansion was renovated into an Italianate style of architecture by Joseph Wharton, a Philadelphia Businessman. Today, visitors can tour fourteen of the rooms including parlors, dining room, library and bedrooms. The Blacksmith and Wheelwright shops at Batsto Historic Village in Hammonton, New Jersey. The Wheelwright made and repaired wheels for carriages and wagons. The Blacksmith shoed horses, and also, made and repaired farming tools and implements as well as domestic hardware such as hinges and locks. Barns on the pathway at Batsto Historic Village in Hammonton, New Jersey. Pitted, aged wood and rusted hinges showing the scars of over a century of weathering were found on this shuttered barn window at Batsto Historic Village in Hammonton, New Jersey.